Heat oven to 375°F. Spray 8-inch square (2-quart) glass baking dish with cooking spray. Add sweet potatoes to 4-quart saucepan; cover with water. Heat to boiling over high heat; cover and reduce heat. Simmer 10 to 14 minutes or until potatoes are tender. Drain; transfer to medium bowl. Mash potatoes with potato masher. Add vegetable oil spread, maple syrup, salt, cinnamon and allspice. Stir to completely blend. Spoon into baking dish. Bake 15 minutes; top with marshmallows. 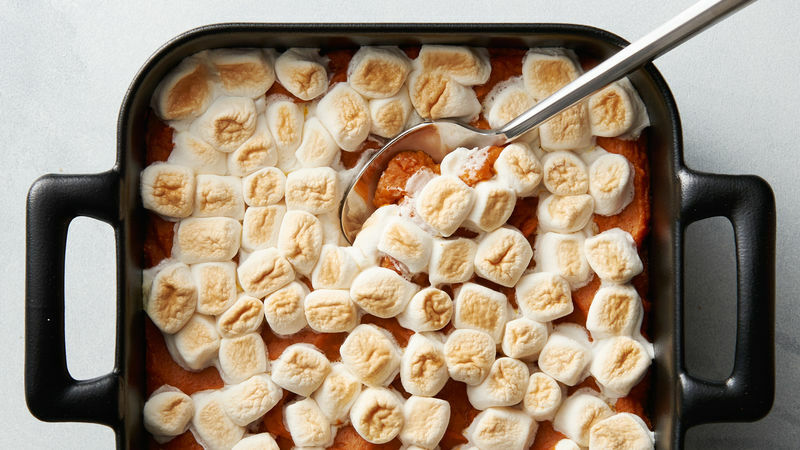 Bake 8 to 10 minutes or until marshmallows are browned and casserole is bubbling around edges. Orange flesh sweet potatoes are sometimes labeled yams in the produce section. Dandies™ brand vegan marshmallows are a great choice for this recipe and can be found in the baking section of the grocery store.